That’s right. This isn’t my first ride on the baby merry-go-round so I wasn’t in a huge rush. But here I am, 32 weeks pregnant and beginning to panic. Why did I wait so long?! Luckily, I was prepared enough to have built a Registry on Diapers.com – at least I know that anything I need can be here in 1-2 days! Even though I procrastinated, they never do! The first items arrived from my registry last weekend. We had spent the day running around and arrived home to find a fabulous stack of boxes.. That were ordered the afternoon before! 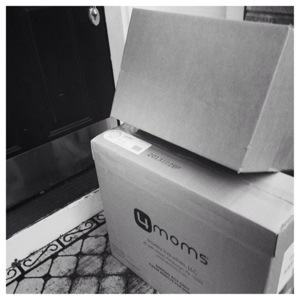 Contained within those boxes were three items that, as the mom of soon-to-be-four children, I find very exciting! In the first and largest box was a 4Moms Mamaroo. (In Silver Plush! Baby’s colors are blue and grey, so it is perfect!) If you already have children, you know that finding a safe place to set down an infant while you entertain/feed your older children or desire a shower is essential. If it can soothe and entertain baby at the same time – even better! When this baby arrives, I will have a toddler with special needs, a preschooler that is only at school for half of the day, and a 2nd grader that comes home daily with homework. 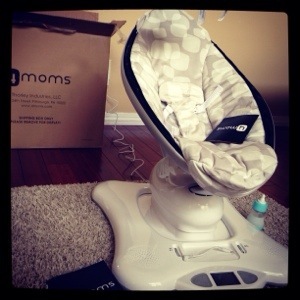 The 4Moms Mamaroo is going to be a critical part of staying sane. Well, that and coffee. With the plush fabric, motorized motions that mimic how you move baby to soothe them, and a noise machine capable of hooking up your own MP3 player to – baby is sure to be comfortable. I may have to put Darius Rucker’s “Wagon Wheel” on repeat just so I can giggle as it moves back and forth playing “Hey, Mama Rock Me!” See, it is entertaining for me, too. An all around winner as far as infant seating and entertainment goes. Contained within the second box were two other fabulous essentials. The first of which is the Baby Chef Steam Sanitizer. I breastfeed – but I know how critical it is to be able to hand someone else the baby and a bottle of pumped milk. It not only assists in my husband and older kids’ being able to bond with baby – but while they do that.. I can actually manage a shower or putting a healthy meal on the table. When you use bottles, getting them properly cleaned. Especially when you perhaps find one that has been lost under the couch for a week. 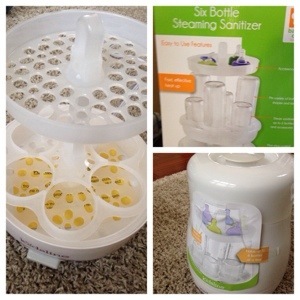 The Baby Chef Steam Sanitizer allows me to sanitize baby’s bottles without needing to run an entire load in the dishwasher. I can guarantee with ease that I always have a sterilized bottle handy. I’m hoping it will work for pacifiers, too. We all know how germy those can get. It’s not obtrusive and sits neatly on my counter. The last item of that first registry shipment was quite possibly my favorite. As most of you know from reading this blog, my toddler is completely in love with Sophie the Giraffe, PhiePhie to him. So much so, I still can’t get him to share PhiePhie, however.. It’s a product that babies adore and entertains them. Luckily – PhiePhie now has friends. Adorable friends. One of those friends arrived in that Diapers.com box. 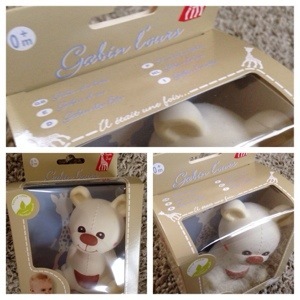 Gabin the Bear. Oh how I love that adorable little bear! I’ll admit, though, I have Gabin the Bear hidden still. I fear my PhiePhieMonster will love him as much as he loves PhiePhie – and I really want to have that sweet little bear for our new baby. I am so glad that, even though I procrastinated, my Diapers.com registry has everything I need for baby listed on it and those items can be on my doorstep within a day or two. I can panic less now. I can even take advantage of the 10% registry completion discount for the truly last minute purchases that haven’t already been bought. Your (and my…) friends and family can take advantage of Diapers.com’s special registry shopping promotion. 15% off a registry purchase! A registry that not only benefits you, but your friends and family, too! I should probably go order some diapers, at some point in time, but as I’ve shown you all above – I don’t need to stress about them arriving in time. Disclaimer: This post was sponsored by the Registry Program at Diapers.com. The opinions expressed are my own and honest. I was sent products for this review from Diapers.com.